Despite strained relations over Russian actions in Ukraine, superpower cooperation in space continued unabated Monday with two cosmonauts and a NASA astronaut departing the International Space Station aboard a Russian Soyuz ferry craft and plunging to a landing on the snowy steppe of Kazakhstan to close out a 166-day mission. Landing in arctic conditions, with low clouds, snow and temperatures near zero degrees Fahrenheit, the Soyuz TMA-10M crew module settled to a jarring parachute-and-rocket-assisted touchdown at 11:24 p.m. EDT (GMT-4; 9:24 a.m. Tuesday local time). Earlier in the day, the weather prompted concern the crew's return might be delayed. Russian recovery forces deployed in a fleet of MI-8 helicopters were unable to initially reach the landing site because of rotor icing and had to return to a staging area in nearby Karaganda. But mission managers ultimately decided to press ahead and Soyuz commander Oleg Kotov, flight engineer Sergey Ryazanskiy and NASA astronaut Mike Hopkins were cleared to proceed with the entry, undocking from the International Space Station's upper Poisk module at 8:02 p.m.
"Bye, bye, station," one of the crew members radioed on the translated space-to-ground audio loop. After moving a safe distance away from the space station, Kotov, strapped into the craft's center seat, monitored a four-minute 50-second rocket firing starting at 10:30 p.m. to slow the spacecraft by about 286 mph. That was just enough to lower the far side of the orbit into the atmosphere for a steep plunge to the steppe of Kazakhstan. "Everything is fine on board. 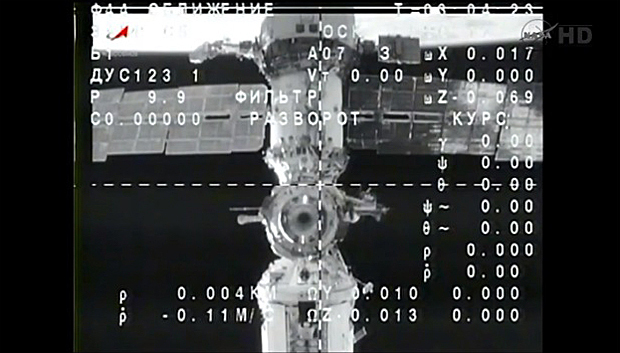 Pressure is stable, everything is (normal)," a crew member radioed. Moments before falling into the discernible atmosphere at an altitude of 87 miles, the three modules making up the TMA-10M spacecraft split apart and the central 6,400-pound crew module oriented itself heat shield forward to endure the extreme temperatures of atmospheric entry. The entry appeared to go smoothly and the spacecraft's main parachute unfurled at an altitude of about 6.5 miles, slowing the craft to about 16 mph for the final stages of the descent. Because of cloud cover, the landing was not seen in realtime video, but Russian flight controllers in radio contact with the spacecraft said the crew was in good condition. Only four of 12 search-and-recovery helicopters made it to the landing site -- non-essential members of the team remained grounded 236 miles away in Karaganda -- but the crews that got there reached the spacecraft within a few minutes of touchdown to help the returning station fliers out of the cramped Soyuz command module. 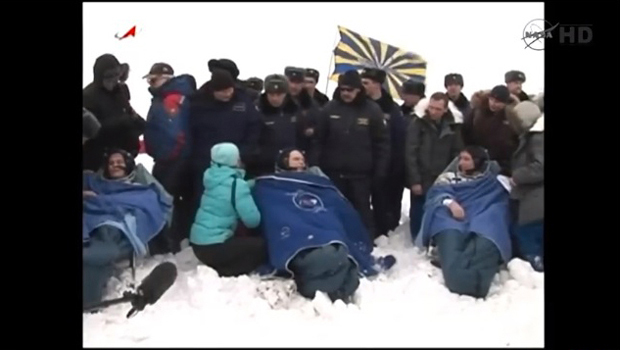 Live video established after touchdown showed all three crew members bundled up in blankets, resting on recliners set up in the snow near their charred descent module. 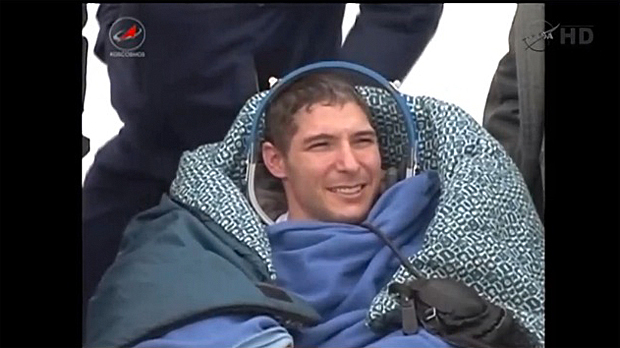 Feeling normal gravity for the first time in five-and-a-half months, Kotov, Ryazanskiy and Hopkins appeared in good spirits, smiling and chatting with ground crews while making brief satellite phone calls to friends and family. "I feel great," Hopkins said, speaking from his recliner. "Thanks, Oleg. Thanks for getting me home." In a departure from normal practice, recovery forces did not set up a medical tent for initial physical exams and instead opted to fly the trio straight away to Karaganda. Once there, the crew planned to split up. Kotov and Ryazanskiy were to continue on to Star City near Moscow while Hopkins planned to board a NASA jet for the long flight back to the Johnson Space Center in Houston. "One of the great things about leaving home is coming home," Hopkins, who left a wife and two sons behind on Earth last September, said in a NASA interview. "Being reunited with my family, I think, is going to be absolutely wonderful." Left behind in orbit were Koichi Wakata, cosmonaut Mikhail Tyurin and NASA astronaut Rick Mastracchio, more than two months into a planned six-month stay in space. During a weekend change-of-command ceremony, Wakata took over from Kotov, becoming the first Japanese astronaut to command the station. "I am humbled to assume command of the space station," Wakata told Kotov and his crewmates. "We will continue to keep station operations safe, efficient and fun as you guys led us to do. So have a safe return and we'll catch you back on the planet in a couple of months." Wakata, Tyurin and Mastracchio will have the station to themselves until March 25 when the Soyuz TMA-12M spacecraft, carrying commander Alexander Skvortsov, flight engineer Oleg Artemyev and NASA astronaut Steve Swanson, blasts off from the Baikonur Cosmodrome for a six-hour flight to the lab complex. Hopkins is the first of his 14-member 2009 astronaut class to win a flight assignment. Raised on a farm in Missouri, captain of his University of Illinois football team and an Air Force flight test engineer, Hopkins said his first spaceflight, including a pair of unscheduled spacewalks in December to replace a critical cooling system pump, met all of his expectations and then some. "Discovering new things is exciting to us," he said in a recent interview. "That's probably the part that we love (the most). There are over 200 experiments that are going on during this increment, and they cover a wide range of areas, areas that we're not necessarily experts in but it's neat to see the results." Asked what had surprised him the most during his stay in space, Hopkins said the experience of floating in the microgravity environment of orbit was a genuine thrill. "Until you actually get up here and experience it, you can only imagine what it's like, and it truly is incredible," he said. "When you can float through a module in any kind of orientation, when you can work on tasks in any kind of orientation, it's truly exciting." "When I first got into orbit, and of course this was my first trip into space, I felt like I was falling," he said. "I felt like I was sitting on the ceiling down on Earth and was wanting to fall down to the floor. And that feeling lasted probably 24 hours. And then slowly after that, I got beyond that and finally, I would say (it took) probably two weeks to a month before you finally realize you don't need up or down." In another recent interview, Hopkins was asked which planet in the solar system he would most like to visit. He promptly said "Earth." "Being away from Earth, this is an absolutely incredible experience and it's something I'll never forget," he said. "But I'm getting ready to come home, and I'm looking forward to it. "You see the views of Earth up here, and it is truly stunning, and it's something that never gets old. But at the same time, I'm really looking forward to feeling the Earth between my toes, feeling a breeze, maybe even standing out in a rain storm. Earth is truly incredible, and I think that's where I'd like to go."